There are several types of containers that can be used for growing vegetables including polyethylene plastic bags, clay pots, plastic pots, metallic pots, milk jugs, ice cream containers, bushel baskets, barrels, and planter boxes. It is important to use containers that can accommodate roots of the vegetables you want to grow as the vegetables vary in sizes and rooting depths. 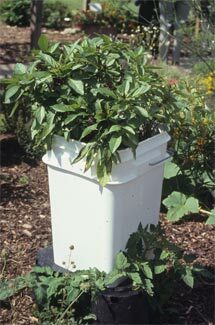 The container needs to have good drainage, and should not contain chemicals that are toxic to plants and human beings. Most vegetables grown in backyard gardens can be grown in containers, although a container's diameter and depth need to be considered when selecting what vegetables to grow. The plant density (number of vegetable plants per container) depends on individual plant space requirements, and rooting depth.